LaFayette CSD has received approval from the New York State Education Department for the plans to make capital improvements at LaFayette Jr/Sr High School, LaFayette Big Picture School, Grimshaw Elementary School, and the District Maintenance/Transportation Building. This $5.4 million dollar capital project was approved by the voters in May 2017. Capital improvements intend to address a number of items from the recent building condition survey and improve spaces in the kitchen areas, cafeteria at the high school, team rooms in the high school basement, and upgrades to the wellness center. Construction is planned for the summer of 2019 with a plan to have the work completed during the fall months. The project was designed by Ashley McGraw Architects in Syracuse, New York. LaFayette utilizes the services of Turner Construction for Construction Management and also employs a part-time Clerk of the Works to oversee capital improvements to the district. Details regarding the drawings, specifications and bid documents are included in the bid announcement found on this web page. The proposed project focuses on LaFayette Junior/Senior High School, Grimshaw Elementary School, and the district office/bus garage/maintenance building. Its scope is based on an extensive evaluation recently performed by the district’s architects and engineers. New York state requires all public school districts to complete the evaluation, called a building condition survey (BCS), every five years. The district plans to pay for the $5,432,950 project through a combination of State Aid funding and expiring debt. It will have no new impact on taxpayers. - Repoint brick, repair and repaint interior plaster in 1965 wing. - Replace interior non-rated, wood classroom doors in 1939 and 1951 wings. - Repair exterior concrete stairs behind gymnasium, including railings. - Renovate kitchen, including floors, walls, and ceilings. Replace all mechanical, electrical and plumbing equipment - including piping, conduit, circuitry and accessories in their entirety - and outdated food service equipment. - Enhance existing security system. - Replace softball field’s backstops and baseline fencing. - Repoint chimney masonry and re-caulk control joints. - Replace outdated glass skylights in toilet rooms and stairwells with high-performing insulated system. - Renovate gym lobby to accommodate serving and cafeteria entry expansion, including expanding existing toilets for ADA compliance. - Repair high school gymnasium wall flashing. - Renovate kitchen, including floors, walls, and ceilings and update serving area. Replace all mechanical, electrical and plumbing equipment - including piping, conduit, circuitry and accessories in their entirety - and replace all outdated food service equipment, including server line. - Renovate cafeteria, including exposed ceiling, acoustic treatment, and variable seating options. - Renovate basement, including updating Wellness Center, constructing a new corridor, creating new team rooms and reconfiguring athletic storage. - Renovate second floor classrooms and hallway. Includes replacing carpeting with resilient flooring and replacing ceilings and lighting (LED). - Repair loading dock by resetting metal stairs, edge angles and add dock bumpers. - Replace interior electrical panels and transformers at first floor janitor’s closet. - Replace public address (P/A) notification system. - Replace domestic water pressure booster system. - Upgrade emergency lighting, including adding an emergency panel and transfer. - Replace athletic field scoreboard. - Replace overhead door at maintenance. - Replace rusted frame at bus garage and in-fill unused louver. - Replace steel windows at maintenance area. - Renovate toilet rooms at maintenance area. District residents will have the opportunity to vote on the project during the annual school budget vote on Tuesday, May 16, 2017. 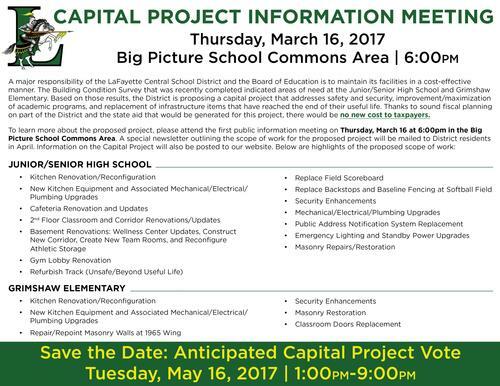 March 20, 2017: In May, LaFayette Central School District residents will have the opportunity to vote on a capital project that addresses improvements and safety and security upgrades at three of the district’s facilities.